"We have to figure out the game within a game, how to beat them. It's just the next one. So we're focused on Game 5"
Does Dwyane Wade have a big game left in him? If he does, the Bulls certainly need it going back to Boston Wednesday for Game 5 tied at 2-2. That being after surrendering what seemed a few days ago like a series clinching two straight road wins. 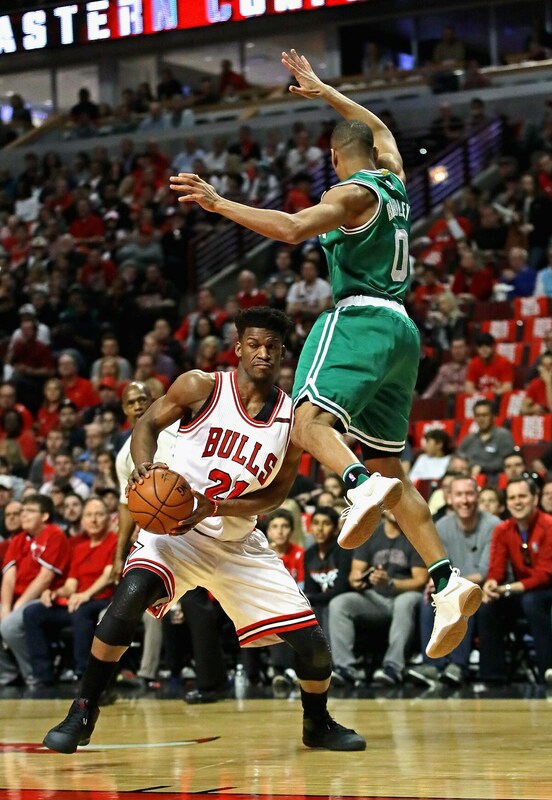 Then, well, Rajon Rondo got hurt, and the point guard auditions commenced again, and Jimmy Butler came through big with 33 points with 19 of 23 free throws in Game 4. But it wasn’t enough as no one else could manage more than 13 points against Boston and its varied and variegated talent, particularly on the perimeter with five double figure scorers. Where have you gone, Dwyane Wade, a desperate team turns it anxious eyes toward you. This is not to suggest the Bulls losing the last two games at home falls at the feet and shot of Wade. There’s plenty of blame to be shared, mostly for starting games without playoff necessities. To be fair, perhaps Wade shouldn’t even be playing. He sustained a fractured right elbow a little over a month ago and was supposed to miss the rest of the regular season. There was no certainty about the playoffs. But he worked himself back for the end of the regular season, and then declared himself ready for the playoffs. It just mostly hasn’t been there, and perhaps that’s just a function of time and play. Wade is averaging 15.5 points, 3.3 assists and four rebounds, all well below his regular season averages and averages in last year’s playoffs when he led the Heat to a surprise conference semifinals seventh game. And that was a pretty loaded Heat team with Luol Deng, Joe Johnson, Goran Dragic and Hassan Whiteside. But Wade stood out averaging 21.4 points, 5.6 rebounds and 4.3 assists and shooting 52 percent on threes. In 14 playoff games, the fewest he scored in a game was 12 points. But he had four games of at least 25 points and eight of at least 20. Thus far in four games, Wade has scored 11 points twice, including Sunday. He had one game of 22 points, Game 2 in Boston. But much of his scoring was late after the Bulls had a reasonable lead, sort of the icing on a well prepared cake. It was important, but he scored 11 of his 22 points after the Bulls led by 12 with eight minutes left. Certainly, the playoffs are considerably about matchups. 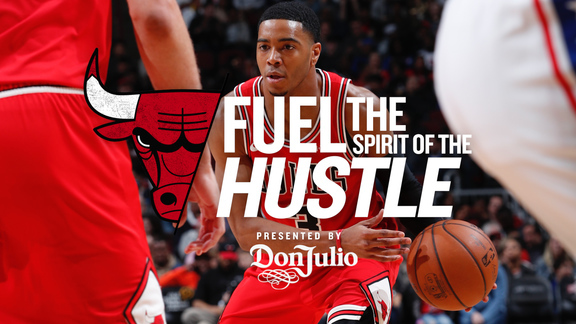 But the Bulls also need to bring a level of commitment, energy, intensity, and pick your cliche. They just haven’t played as hard often enough as much as the playoffs require. And certainly not as hard as the Celtics the last two games. “It's going to be the number one thing in the game (Wednesday), especially on the road, to get off to a good start. We did a solid job of that in Games 1 and 2. They got off to a little bit of a lead, but we got back and had a lead after the first quarter, and that's what it's going to take. We can't get down 20 and expect to fight back. We did that the first two home games. I didn't think energy was the problem in the last game. I didn't think we got off to a very energetic start in Game 3. We need to do something to take away some of those three-point shots that they're getting early in the game. But again, you've got to go out and have great activity, especially on the road. You've got to fight through adversity, because we're going to hit it on Wednesday night." If momentum is a person, then it’s six on five for the Celtics. Losing the first two games at home and winning a series is almost impossible. Basically, only great teams have done so. The Baylor, West and Chamberlain Lakers of 1969, the champion Rockets of 1994. The Bulls cannot let it be what it’s supposed to be about anymore. Because that means Boston would win. The loss of Rondo was devastating. Though Wade is the team’s second most famous player now, Rondo has meant the most after Butler. His pace, energy, annoying defense and attitude accelerated the Bulls. He’s been practicing sort of informally and Tuesday was shooting, though mostly left handed. It’s possible he could try to play in Game 6 or if there is a Game 7. He is listed out for Game 5 for now, and it’s been clear by his activity he’s likely going to try to play sometime in this series. Though Hoiberg said the Bulls have had the energy to start, at least in Game 4, it’s been difficult to see. Not that the players didn’t care, but without Rondo it’s not a naturally energetic group. Butler given his game long responsibilities tends to defer and pace himself a bit early. Wade has mentioned a few times this season he takes a few minutes to get into games. Robin Lopez isn’t noted for his quickness; nor is Nikola Mirotic. Isaiah Canaan should help with that as he is scheduled to start Game 5 after his terrific return in Game 4. I’d probably go with Bobby Portis, who is the most other energetic player on the team, and also a rebounding and physical complement to Lopez. If the Bulls aren’t going to push the ball that hard, perhaps play more slowly and go into Lopez multiple times. Boston has gone small with Gerald Green to start, and it’s helped them. Maybe play to Lopez more; use Portis more. Also, get Wade to find Green. 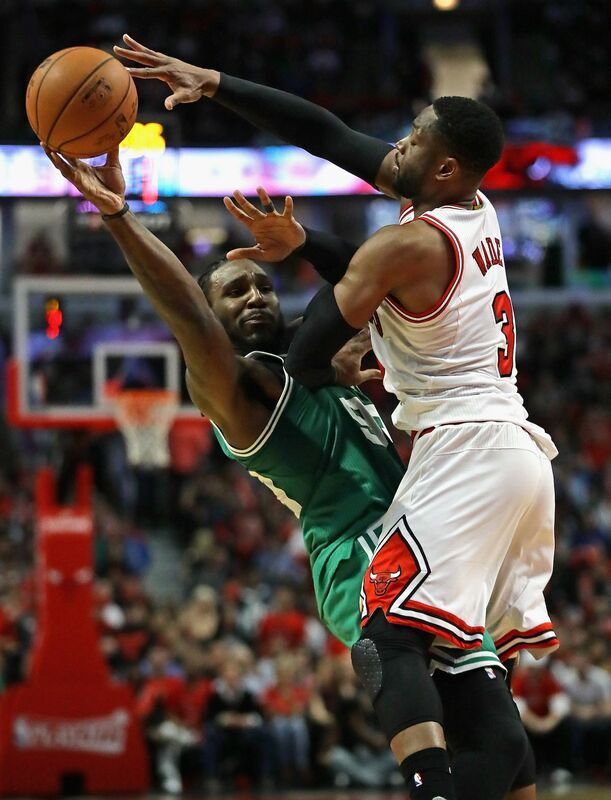 Wade, especially early in games, tends to sink into the lane on defense to play for steals. Boston has taken advantage swinging the ball to find Green, who made big three-point shots early in Games 3 and 4 to help spur the Celtics. Green had 13 points in the first quarters of Games 3 and 4; Wade had 10. Gerald Green cannot outplay Dwyane Wade. We’ve seen great games from Wade this season. The near triple double in the February win over the Cavs. Scoring 31 in a win over the Kings, 33 in 31 minutes against Atlanta, 35 early in the season against the Knicks. No one expects Wade at 35 and coming off a serious injury to play like that on a regular basis. But he hasn’t had a game like that yet in these playoffs. Great players usually can summon up one somewhere, sometime, when it’s needed, when it’s big. Dwyane Wade is a great player, in his career even better in the playoffs. The Bulls don’t want to have to face winning two straight, the last a seventh game in Boston, to win this series. Butler needs some help without Rondo. Sure, it would be nice if Portis or Mirotic or Paul Zipser had one of these unexpected scoring and shooting games, like we saw earlier in the series, though Rondo did set them up for a lot of that. “When we're on the road there are less distractions,” Wade said. “There's less to worry about. You don't have your whole family there looking at you, worrying about if you go down 8-0; the crowd's going to get a little dull on you. You don't worry about that on the road. You just play. So it's a little different. “It's a best of seven series. It's a one/eight series, first of all. Everybody in the world was shocked that we were up 2-0. We played very well, but we still talked about it being the best of seven. Our goal is to focus on the next game. This is a good team we're playing. It's a chess match. We have to figure out the game within a game, how to beat them. It's just the next one. So we're focused on Game 5." Does Wade have another one left in that special career locker? It would be a very good time to take it out.